Save money on new hires with iRecruit’s Work Opportunity Tax Credit Program integration. 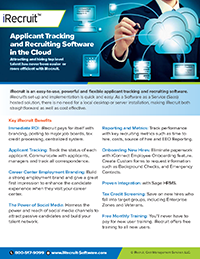 To learn more about iRecruit for Sage HRMS please join us for a web-demo on Tuesdays or Thursdays at 2pm, call us at 1-800-517-9099 or visit our website www.irecruitforsagehrms.com. This entry was posted in Blog, iRecruit Blog and tagged sage hrms. Bookmark the permalink.